On 18 April 2018 Mattarella tasked the President of the Senate, Elisabetta Casellati, with trying to reconcile the issues between the centre-right and the Five Star Movement, in order to break the post-election political deadlock and form a fully functional new government. However she failed to find a solution to the conflicts between the two groups, especially between the M5S and Forza Italia. 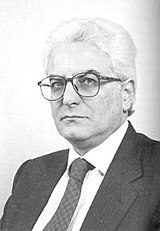 On 23 April 2018, after Casellati's failure, Mattarella gave an exploratory mandate to the President of the Chamber of Deputies, Roberto Fico, to try to create a political agreement between the Five Star Movement and the Democratic Party. However, on 30 April, following an interview of the PD’s former leader Matteo Renzi in which he expressed his strong opposition to an alliance with the M5S, Di Maio called for new elections.